The IBM Thinkpad R30 laptop computers typically come without Wifi 802.11 wireless internet support, but it seems like they were perhaps originally meant to. Searching on the internet revealed some mention of a small number of variants of the R30 which did indeed have the wireless support provided, but if you are missing it, you can add it yourself. Both of these items are available from various vendors on eBay. My own experience follows below. Since this notebook features a (typically empty) miniPCI slot accessible through the underside of the notebook, it is pretty easy to just pick up a miniPCI 802.11 network adapter and insert it into that slot. IBM provides some quick instructions on how to do that on their website. The harder part is installing antennas for that adapter to use. Space is pretty tight inside this notebook, and many of the conventional antennas sold for use inside notebooks will barely fit, if at all. I had previously installed a single antenna inside the notebook, which featured a short (approximately six inches) cable. The antenna barely fit inside the case, and reception was poor. Compared with the dual antenna configuration outlined below, using a single antenna inside the notebook base section hardly seems worth it. Prudent advice would seem to be to ignore advice found elsewhere indicating equivalent performance from a single antenna connected to the 'Main' connector. The Thinkpad R30/R31 Hardware Maintenance Manual available from IBM shows an internal antenna in the removals and replacements section. A copy of the manual is available here. The diagram below is taken from the manual and shown here for your convenience. The type of antenna shown above is available online from several independent vendors if your notebook does not already contain one. Non-wireless models typically don't already have one inside. However, better results were obtained using the flat, square antennas such as shown below. These square antennas fit perfectly inside the R30 laptop's LCD panel casing, and seemed to yield better reception than the smaller antenna shown above. The photo shown above was taken from an eBay auction by a vendor selling these antennas. Vendors may come and go, but the antennas themselves are what you are after. This particular vendor provided great service, but i'll leave the choice of who to buy from up to you. These specific antennas are advertised as having extra long cables so as to allow them to be installed inside the laptop's LCD panel casing. This is important, as typical internal 802.11 antennas for laptops often lie inside the base of the unit. You can read more about these particular antennas here. For archival purposes, I have stored that image of the vendor's antenna details because eBay auctions tend to come and go. The vendor advises you simply cram the antennas into the base of the laptop itself rather then mount them in the LCD panel casing, probably for people who are not technically inclined and who would otherwise damage their notebook. However, if you have some technical expertise, some basic tools, and are not afraid of opening up a functional notebook computer, you can install these yourselves into the screen and enjoy optimal reception for wireless networking. There was discussion several months ago about some laptop vendors locking out certain miniPCI cards unless they matched a vendor code already stored in the computer's BIOS. I am unsure whether or not this applies to the IBM Thinkpad R30 specifically, but there has been discussion about subsequent models from IBM and most other vendors. Rather than take chances, I purchased a card from a vendor which IBM themselves often used in this type of notebooks. Your vendor may note which miniPCI cards are specifically known to be compatible with various notebooks. I would suggest only purchasing a card you are confident will work inside your laptop, especially if you are shopping online. Some other IBM notebooks have specific hardware support for 802.11 miniPCI cards, such as pressing Fn-F5 to enable or disable the wireless card's functionality. For those models of notebook, the choice of miniPCI card would be more important so as to ensure compatibility with these features. The Thinkpad R30 doesn't have this feature in hardware, so shopping for cards allows a bit more flexibility. The vendors who sell these network adapters often provide additional information, such as notebook model compatibility. In our case, the vendor who sold us our card provides additional details when promoting their products, similar to that shown in the saved image here for your reference. What Tools Are Needed To Install Antennas In The LCD Panel ? Using the Hardware Maintenance Manual we linked to above, the process of installing both the miniPCI card and antennas will mostly be trivial. Since the flat, square antennas discussed above will be installed in the LCD panel casing, simply follow the instructions to disassemble the laptop down to the LCD panel, remove the LCD panel from the laptop base, and then follow the instructions to open the LCD panel casing itself. The antennas should be mounted into the top-left and top-right corners of the LCD panel casing. Once the LCD casing is open, the LCD panel itself rests inside the casing by gravity, and can be moved aside momentarily to allow insertion of the antennas behind the panel. The panel will hold the flat, square antennas in place simply by resting against them. 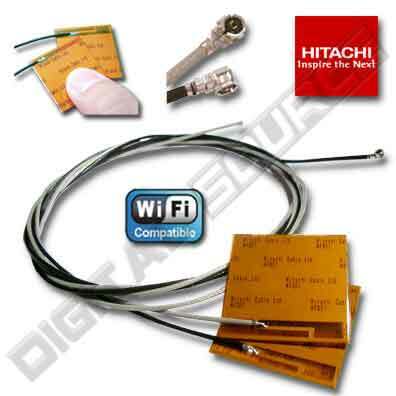 Having purchased antennas such as those discussed above will ensure the antenna cables are long enough to be threaded around the inside of the LCD casing, out of the panel, into the laptop, and around to the connectors on the miniPCI network adapter. Thoughtfully, one of the antenna cables is slightly shorter than the other so as to accomodate placement in the two top corners of the panel casing. The notebook itself also features a channel beneath the keyboard on top of some of the plastic parts which is perfect for threading and routing the antenna cables after they are outside of the LCD panel casing. This will help you get the antenna cables across the systemboard, through to the other side, and connected onto the network adapter without unnecessary crimping or looping of the cables. As in life, quality results come from quality equipment. Compared to a single inferior antenna mounted in the laptop base, reception was stellar when using a pair of the flat square high gain LCD-mounted antennas described above. The Thinkpad R30 is a suitable candidate for receiving antennas installed in the LCD panel casing, and probably should have been factory installed from the beginning. While there may not be much other information available on the internet on doing this upgrade yourself on this unit, rest assured it can easily be done in an hour or two.